Take this quiz and find out: How “Calm, Cool and Connected” are You? Do you lose track of time when scrolling through social media or websites, or watching TV? Do others in your life complain about the amount of time you spend on technology? Have you ever chosen to spend time at home watching TV, playing video games, or answering emails instead of going out with family members? Do you find yourself answering texts even if it means interrupting what you are doing? Do you think your use of technology decreases your productivity? Do you watch TV, use the computer or check your phone late at night? Do you use the phone during meals or eat in front of the TV? Have you ever changed vacation plans because of Wi-Fi availability? Do you correspond with some online-only friends more than people you actually see in real life? Do you have 3 or more active social media accounts you use daily? If someone asks to have a talk, do you keep your phone close in case it vibrates? Do you have your phone next to your bed or pillow when you sleep? Do you check your email more than 20 times day? Not counting at work, do you spend more than 4 hours a day using electronic media such as TV, video games, phones or tablets? Do you feel behind and overwhelmed on most days with all you have to do? When you have free time, do you use the phone or another device to relax? Do you ever regret something you watched online or on TV, or something you posted on social media? Do you find it difficult to sit through church without touching your phone? On your day off, would it be hard for you to refrain from all electronic media? If you answer YES to less than 3 questions, you are Ninja Calm, Cool and Connected. You have a great ability to balance technology and being fully present. You may want to loan this book to a friend who texts during your face-to-face conversations. If you answer YES to 4-9 questions, you are Almost Calm, Cool and Connected. You haven’t gone overboard with technology but you can easily get swept away by screen madness. Work on building a few positive habits by setting limits on your screen time. Your relationships will be healthier and you’ll be much happier as a result. If you answer YES to 10-14 questions, you are Barely Calm, Cool and Connected. Warning lights are flashing. You are spending too much time looking at a screen. There are more important things to do like being with loved ones, getting a good night’s sleep, and having fun without the help of technology. Make the decision to scale back your screen time before it dominates your life. If you answer YES to 15-20 questions, you are Nowhere Near Calm, Cool and Connected. Red alert! Your phone is in your pocket or within three feet at all times because you love that thing! Without the constant stimulus of your phone and other screens, you’d feel anxious. 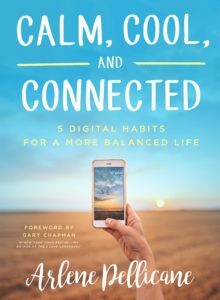 You don’t know how to do quiet, so this book will really help you create distance between you and your phone, so you can get closer to the people you care about most.